(Rev 13:2 KJV) And the beast which I saw was like unto a leopard, and his feet were as the feet of a bear, and his mouth as the mouth of a lion: and the dragon gave him his power, and his seat, and great authority. 1-25-04 - DREAM - I was in Milwaukee in an apartment. I looked out the window and saw two animals on top of a telephone pole, sitting side by side. It was a lion and a bear. The lion and the bear came down from the telephone pole and stood in the street holding a sign over their heads that showed only the grey sky behind them. Back in the apartment, my daughter and I were looking at catalogs of clothing - it was all summery fabric and party dresses. My daughter said she would buy some fabric and I could teach her how to sew. She handed me 7 pairs of children's socks rolled up and I put them away in her daughter's bedroom dresser drawer. All my work was done, so I was going to go into the basement and wash the bath towels. Then I found out that my Uncle Roy had been arrested and he came to the apartment to wait for the parole officer. The parole officer arrived and Uncle Roy and I were sitting on my bed discussing whether or not he would have television privileges during this arrest. She said he would be restricted to children's shows. I thought that would be okay because I had seen some adult shows and all they said were bad words. The female parole officer took Roy away then and I saw she was 9 months pregnant and had her daughter (about 12) and a son (about 7) with her. NOTE: Roy means 'red-haired' . 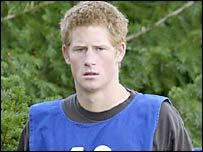 Prince Harry? 10-16-04 - DREAM - I was in a big parking lot and there was a huge pile of dirt, ice, and roots on top of my car. It seemed I had to get to the last good root to build my house with. I was pulling out one root at a time and discarding it. This process felt like pulling arms off of people - a rather gruesome process. I couldn't reach the last root. I tried to reach it from several angles and it was worse on one side than from another. My son Michael suggested that I open both car doors at the same time and actually stand on the edge of the door entrance which would be about a foot higher. That worked. Thank you Michael. So, I finally got to the last root so I could plant it and eventually build my house with the tree that grew from it. As I woke up, I knew it was 'The Root of Jesse". If one adds up the years indicated by the female parole officer 12 + 7 + 9 months, we get 19 years and 9 months. In a speech given by Queen Elizabeth in celebrating her Golden Jubilee on the throne, she indicated that she had no intention of stepping down in favor of Prince Charles to be King. Considering that Queen Elizabeth's mother lived to be 101, the likelihood is that Queen Elizabeth also could live another 20 years just like her mother. In the year of 2004 when I had this pair of dreams, Queen Elizabeth is 78 years old and Prince Charles is 55. 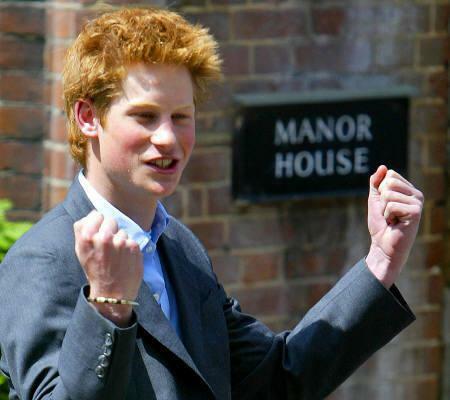 His son Prince William is 23, and Prince Harry is 20. Francis Bacon, Son of Queen Elizabeth is said to be of the same (Merovingian/Magdalen/Grail Bloodline) as Shakesphere, penned the DESIGNS which became the Masonic Template for America's layout.. (Washington DC pentagram and the Eldorado Map).. which included the same Templar Offset Pentagram embedding motif from Southern France, Gothic Cathedral landscapes and Mars/Cydonia! If this is true, then so is Queen Elizabeth, Prince Charles, Prince William, and Prince Harry! In the now popular film "ELIZABETH", we see that there definitely was secret intrigue between Queen Elizabeth and her lover... Robert...(and son???). In "Shakespere in Love", we hint that his romances suggested PERSONAL ROYAL CONNECTIONS. Recent films have usefully whetted American's appetite to learn their mystic roots, even in the royal families of Europe. After the 'Holy Blood Holy Grail' mystery broke, thanks to "Genesis of the Grail Kings', it has become abundantly clear (from the Sumerian tablets-the REAL origin of the H'iburu Bible) that SOMEONE HAS BEEN BREEDING ALL THE ROYAL FAMILIES OF THE WESTERN WORLD FOR MILLENNIA exactly the way we breed show dogs. According to Gardner, the author, our word 'King' for example is a mis-spelling of the Hiburu word CAIN, whose relative's named "TakAdama's" meaning borgs from Orion, were shortened to Adam (& Eve).... whose genesplicer was Enlil, son of An, (An-nunaki / Tuethe De D'AN an) a reptilian from Sirius who was later called Jehovah and El Shaddai. Now whether or not you believe any of this which shakes the roots of most every religion on the planet, it is difficult to deny after inspecting the evidence linked above, that indeed, Bacon as Shakesphere and the Queen's son, falls solidly in the bloodline, for which Gardner named his book: literally a "Genesis of the Grail Kings". 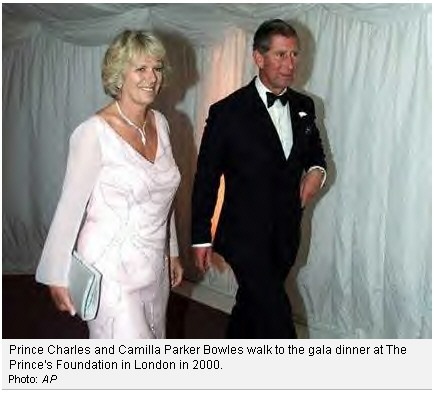 Parker Bowles, then Camilla Shand, is said to have told the Prince: "My great-great-grandmother was your great-great-grandfather's mistress, so how about it?" They first met at a Windsor polo match in 1970 and met each other again in June 1972 at a London club. The two became very close, but the relationship cooled when Charles joined the Royal Navy. In the recording of a telephone conversation between the two, made in December 1989, Charles said "I love you" to Camilla and added many other highly personal endearments. When the Prince admitted he had committed adultery after his marriage to Diana had broken down, Camilla was widely assumed, but never confirmed, to be the other woman involved. However, in 1999 Camilla met Prince William and Prince Harry for the first time, and the teenagers and she later hosted a glittering party at Highgrove for 200 guests to celebrate Charles's 50th birthday. ONE of history's longer and more troubled courtships ended on February 10th. Five years after their first public appearance together and two decades after Prince Charles's first marriage became, in Princess Diana's words, “a bit crowded”, the prince is to marry Camilla Parker Bowles, his long-time lover. The wedding will take place on April 8th. Why now? Because, it is said, they were fed up with the awkwardness their ambiguous status created. Three months ago, at the wedding of Charles's godson, they were given seats several rows apart, and consequently decided not to attend the ceremony. The people seem ambivalent. In 1997, shortly before Princess Diana's death, a MORI poll found that only 13% of respondents reckoned Mrs Parker Bowles ought to become queen, while 67% were opposed. Last month, though, a Populus poll for the Times found that 52% were in favour of the marriage. It did not ask whether Mrs Parker Bowles should become queen. That difference of opinion may be why the royals have decided that Camilla will not be queen. She will be the Princess Consort, and the Duchess of Cornwall. That may require legislation. British politicians are likely to oblige, but other Commonwealth countries may also have to be consulted. The other potential problem is the Church of England. Not that the couple wants to marry in church—the wedding itself will be civil, the blessing religious. But the Church, which Prince Charles will head if he becomes king, takes a dim view of the remarriage of divorcees. In 2002, the General Synod decided that officiating clerics could solemnise unions only in exceptional circumstances. It may look odd for a divorced man who has married a divorced woman to uphold the church's traditional opposition to remarriage. Not that odd, though, to the Archbishop of Canterbury. He says that he is pleased and will officiate at the blessing, so it sounds as though the religious establishment has been squared. Family, friends, and public figures joined together today to congratulate the Prince of Wales and Camilla Parker Bowles on their impending marriage. The Queen and Duke of Edinburgh led a host of family tributes, saying the announcement had made them “very happy”. In a statement released by Buckingham Palace they said: “We have given them our warmest good wishes for their future together.” Princes William and Harry expressed support for their father’s decision, wishing him and Camilla “all the luck” in their life together. Meanwhile, Prime Minister Tony Blair said the Cabinet had sent the couple a message congratulating them on the “happy news” after its meeting this morning, and the announcement was also welcomed by Tory leader Michael Howard and Liberal Democrat leader Charles Kennedy. The Duchess of York, currently away in the US, said she was “very happy” for the Charles and Camilla. The Archbishop of Canterbury endorsed the wedding plans, saying: “I am pleased that Prince Charles and Mrs Camilla Parker Bowles have decided to take this important step. “I hope and pray that it will prove a source of comfort and strength to them and to those who are closest to them.” Dr Williams has accepted an invitation to preside at a service of prayer and dedication following the civil ceremony on April 8. Former Archbishop of Canterbury Lord Carey said there were “constitutional difficulties” and “voices in the Church who raise concerns” but no “great difficulty”. He told the BBC Radio 4 The World at One programme: “Absolutists will not want the marriage to happen at all. I think that is a minority position. But Earl Spencer, the brother of Diana, Princess of Wales, declined to comment on the match, as did Mohammed al Fayed, father of Dodi who died in the Paris car crash with the Princess. Representatives from charities supported by the Prince and his bride-to-be also sent their best wishes. The National Osteoporosis Society, of which Mrs Parker Bowles is president, said it was “delighted”. Feb. 11, 2005 (Bloomberg) -- Prince William should become king of the U.K. on the death of Queen Elizabeth II instead of his father Prince Charles, according to a poll conducted by YouGov for the Daily Telegraph newspaper. Prince Charles's office yesterday said that he will on April 8 marry Camilla Parker Bowles, with whom he committed adultery during his first marriage to William's mother, Diana, Princess of Wales. While 65 percent of 1,313 people aged 18 or more questioned yesterday by the pollster said Charles should marry Camilla, more people chose William, 22, than Charles, 56, when asked who should be the country's next monarch, the first time that has happened, according to the Telegraph. The online poll showed that 41 percent said William should succeed Elizabeth, compared with 37 percent who chose Charles, according to results published on the YouGov Web site. Nineteen percent said there should be no monarch. The pollster gave no margin of error. 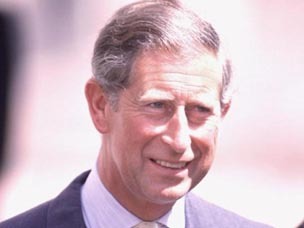 A Gallup poll in 1998 showed 48 percent chose Charles and 22 percent preferred William, the Telegraph said. As king, Charles will also be the supreme governor of the Church of England. The church in February 2003 passed a motion to allow divorced people to remarry in church in ``exceptional circumstances.'' 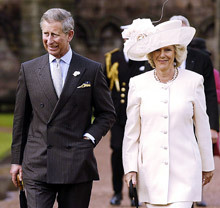 Charles and Camilla, who is also divorced, will marry in a civil ceremony at Windsor Castle, west of London. Their marriage will then be blessed by Archbishop of Canterbury Rowan Williams, in a separate service. A total of 49 percent of those polled thought Charles shouldn't be the formal head of the Church of England on becoming king, compared with 37 percent who thought he should. Charles's office said Camilla won't be called queen when Charles accedes to the throne; rather she will be known as the princess consort. Forty percent agreed with that choice of title, while nearly half of those polled said she shouldn't have any title at all. Only seven percent said she should be queen. Charles, met Parker Bowles, 57, at a polo match in 1970. He married Diana in July 1981 and had two sons, princes William and Harry. Diana died in a car crash in Paris in August 1997, a year after divorcing Charles. Camilla divorced her husband, Andrew Parker Bowles, in 1995. Elizabeth II took over the throne after her father George VI died in 1952. Charles since then has been heir to the throne, and William is next in the line of succession. LONDON (Reuters) - The Queen has given a clear signal that she intends to stay on the throne, quashing persistent media speculation that she might step down in favor of Prince Charles. In a speech on Tuesday to both houses of parliament to mark the official start of her Golden Jubilee celebrations, she stressed what she called the importance of stability and continuity in the country's institutions as well as national values. "I would like above all to declare my resolve to continue, with the support of my family, to serve the people of this great nation of ours to the best of my ability through the changing times ahead," said the queen, who turned 76 this month. The media have speculated over the years that Queen Elizabeth might want to "retire" in favor of Charles, 53. "Only the passage of time can filter out the ephemeral from the enduring. And what endure are the characteristics that mark our identity as a nation and the timeless values that guide us. "These values find expression in our national institutions -- including the monarchy and parliament -- institutions which in turn must continue to evolve if they are to provide effective beacons of trust and unity to succeeding generations," she added. Tuesday's speech in Westminster Hall, where her mother lay in state earlier this month following her death at age 101, came a day before the monarch was to begin a tour through the country to mark her celebrations of 50 years on the throne. The tour begins in Cornwall and ends in Scotland on August 7. On Monday night the Queen and all five of her living prime ministers dined at Downing Street. Apart from the queen and Prince Philip, Margaret Thatcher, James Callaghan, John Major, and Edward Heath attended the event hosted by Prime Minister Tony Blair. Also present were relatives of five other late prime ministers -- Winston Churchill, Anthony Eden, Harold Macmillan, Alec Douglas-Home and Harold Wilson. The dinner marked the formal start of festivities to celebrate the jubilee year which will also include concerts at Buckingham Palace and a host of public events including street parties. LONDON (Feb. 23, 2005) - Queen Elizabeth's decision not to attend the wedding of her son and heir has heaped humiliation on Prince Charles and his long-time lover Camilla Parker Bowles, royal-watchers said Wednesday. Lord Falconer, the Lord Chancellor, who is head of the judiciary, insisted Wednesday that a civil marriage for the future monarch was legally valid. ''The government is satisfied that it is lawful for the Prince of Wales and Mrs. Parker Bowles, like anyone else, to marry by a civil ceremony,'' he said in a written statement. The Queen's surprise announcement that she would not be going to the town hall has added a new twist to the saga. The Queen, who has never shown any approval of Charles' 34-year-old affair with Camilla, will attend the church blessing ceremony afterward at the historic castle west of London and is paying for the wedding reception. But for the House of Windsor, already tainted by scandals, divorce and tragedy, the debacle has been another blow. 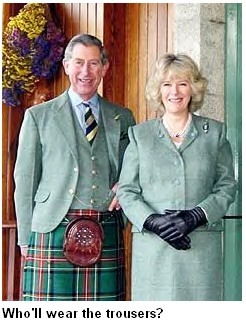 ''It is humiliating and embarrassing for Charles,'' said royal author Judy Wade. ''This is a PR disaster turning into a farce. Royal ceremonials always go like clockwork. Now they cannot even organize a wedding in a town hall,'' she told Reuters. ''This has got to stop, otherwise they will ruin the whole fabric of the monarchy,'' he told Reuters. Tying the knot is proving a legal nightmare for Charles, already fearful that people will never warm to the woman widely viewed as the wrecker of his marriage to Princess Diana, killed in a 1997 Paris car crash a year after her divorce from Charles. When aides discovered that Windsor Castle would have to be opened for public weddings if a license were granted to hold the ceremony there, Charles switched the venue to the distinctly less grand town hall, just down the road. The Queen has perhaps been mindful of the monarchy's dignity in turning her back on the civil ceremony, royal watchers say. ''I'm sure the Queen does not feel it is appropriate, nor does anyone else, for her to pad across the road from Windsor Castle to the register office opposite,'' said royal biographer Robert Lacey. Charles, who at 56 still calls the monarch ''Mummy,'' will inevitably feel the fates are conspiring against him at every turn before the April 8th ceremony to the 58-year-old Parker Bowles. The left-leaning Guardian newspaper could scarcely contain its glee at the downmarket lurch of the royal nuptials. ''All it needs now is a punch-up at the reception,'' it said. Feelings were running high too among tourists outside Buckingham Palace. Relationships and fat, swirled together by the cocktail stick of celebrity, have given this week's gossip magazines plenty to chew on. The recent outbreak of celeb knot-tying included the biggest hook-up of them all, as the future king wooed his bride with his grandmother's ring. For a media-proof fortress, Buckingham Palace leaks like a sieve, if the plethora of anonymous "royal sources" quoted in the goss mags are anything to go by. The royal kids are spooked by the whole thing, Who Weekly reports, while running a photo of Prince William glowering at his dad. Will and Harry have never been in a photo with Camilla, and Who smells a rat. "They are reluctant to be used for stunts," sniffed a royal source. But it was New Idea, with colours still wistfully nailed to Diana's mast, that went in hardest on the wedding. Bad boy Prince Harry had a "hissy fit" over his dad's choice of bride, and the fact that his girlfriend Chelsy Davy reportedly hasn't been invited to the wedding. "Harry can't understand what his father sees in Camilla," a snooty source confided. "He thinks she is unattractive and has no personality." [Entertainment News]: PRINCES William and Harry will have no formal roles at their father's wedding to Camilla Parker Bowles, it emerged yesterday. They had been widely expected to be the two supporters who traditionally accompany heirs to the throne at the altar. Some reports even suggested William had agreed to make the best man's speech and carry the rings – a strong signal of acceptance of Mrs Parker Bowles. But their lack of involvement highlights the family tensions threatening to undermine the big day on April 8. When Charles married Princess Diana in 1981, his brothers, Andrew and Edward, were his supporters. This time, it is understood, he has decided not to ask any close family members to take on the duty. As a result, Mrs Parker Bowles has chosen not to have any bridesmaids. William and Harry have told their father they want him to be happy and assured him they do not oppose the wedding itself. But Charles knew he could not ask them to endorse it publicly by standing at his side. Seven years after their mother's death, they still resent the role of Mrs Parker Bowles in the break-up of their parents' marriage. The legal mess attending the marriage also deepened yesterday, when it seemed an Act of Parliament would be needed to make the union legal. Mrs Parker Bowles was married to her first husband in the Catholic Church. As a future monarch, Charles cannot marry a Catholic, though she no longer worships in that church. Experts say if the couple marry in a registry office, and not a church, the marriage will not only be invalid but Mrs Parker Bowles could be a bigamist in the Church of England's eyes. LONDON, April 4 - Prince Charles announced Monday that he would delay by 24 hours his marriage to Camilla Parker Bowles to avoid a clash on Friday with Pope John Paul II's funeral at the Vatican. Instead, Charles will attend the papal funeral as a representative of Queen Elizabeth II. "As a mark of respect, His Royal Highness and Mrs. Parker Bowles have decided to postpone their wedding until Saturday," a spokesman for the prince said. Only the day before, the prince's office said the wedding would proceed on Friday even if it clashed with the papal funeral. The change on Monday suggested the couple had come under pressure to be more flexible. The prince, heir to the British throne, cut short a skiing holiday in Switzerland on Monday to fly back to Britain to attend Vespers for the Dead in the pope's honor at Westminster Cathedral in London. His fiancée will not accompany him to the funeral, the British Press Association reported. The previous marriages of the prince and Mrs. Parker Bowles ended in divorce. Paddy Harverson, Prince Charles's communications secretary, said: "The prince very much wanted to go to the funeral. He had a lot of respect for the pope. He feels this is absolutely the right thing to do. Mrs. Parker Bowles agrees entirely. The wedding is still going to be a good day, but it has just been pushed back 24 hours. Hopefully the majority of guests that were going on Friday will be there on Saturday." Apart from the potential pitfalls of staging a royal wedding on the same day as a papal funeral, the scheduling conflict created practical problems. The Most Rev. Rowan Williams, the archbishop of Canterbury and spiritual leader of the Anglican Church, who is expected to attend the funeral, had also planned to preside at a blessing service on Friday for Charles and Mrs. Parker Bowles. Prime Minister Tony Blair, too, wished to attend both events. "The prime minister is now very glad he is able to go to both events," his spokesman said. But the postponement - if only for a day - was one more of the mishaps that have dogged the royal wedding since April 8 was chosen two months ago as the big day. At first, the marriage was supposed to take place at Windsor Castle, west of London, but that plan fell through because the royal residence could not be licensed for a single royal wedding without throwing the castle open to nuptials of commoners. 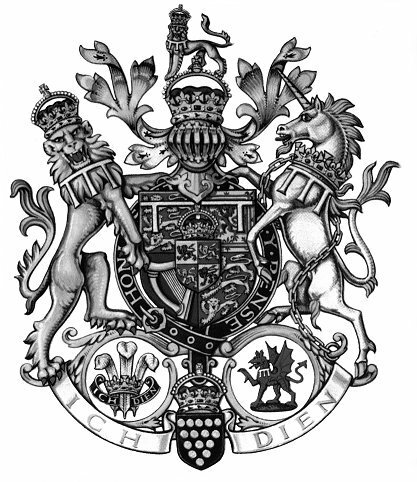 Then there were legal challenges, based on legislation dating from 1836, to the idea of a civil wedding for a member of the royal family, and questions were raised by critics about the divorced status of both the prince and his fiancée. The couple overcame the objections in part by citing their human rights. On top of that came issues of the prince's family, past and present. Citing her son's avowed desire for a low-profile civil ceremony, Queen Elizabeth said she would not attend the civil marriage ceremony, now to take place at a registry office in Windsor's Guildhall. At almost every step, moreover, Mrs. Parker Bowles, 57, has been compared unfavorably with Diana, Charles's first wife, who died in a car crash in Paris in 1997. A postponement caused by a papal funeral also presented a historical twist: King Henry VIII broke the English church's tie to the papacy in the 16th century to permit him to end one marriage and begin a succession of others in his quest for a male heir. With the announcement of a postponement, a royal marriage of divorced people gave way to the imperatives of the papacy. The gravitational pull of Rome was so great that Mr. Blair decided Monday to postpone the expected announcement of an election date out of deference to the service in Westminster Cathedral, which he attended with his wife, Cherie. The election is expected on May 5. The delay in the wedding brought its own share of headaches. Royal officials were reported scrambling to notify 750 guests invited to a prayer service at Windsor's St. George's Chapel of the change. Another worker in this cause, says: "From the tables we are able to furnish a complete list of the royal line from David and Zedekiah to Queen Victoria. We believe the account here given is very nearly cor­rect. If any error he detected we should be happy to be informed. Dates after private names refer to births and deaths; those after sovereigns' to their accession, and death: and b and d stand for born and died (vide, Talmud, London, 1887)." 9. Lamech (B. C. 3125-2349). 12. Arphaxad (B. C. 2341-1903). 13. Salah (B. C. 2306-1873). 29. Boaz (B. C. 1312), Ruth. 32. K. David (B. C. 1085-1015), Bathsheba. 33. K. Solomon (B. C. 1033-975), Naamah. 34. K. Rehoboam (B. C. b. 10166, d. 958), Maacah. 35. K. Abijah (B. C. 958-955). 36. K. Asa (B. C. 955-914), Azubah. 37. K. Jehoshaphat (B. C. 914-889). 38. K. Jehoram (B. C. 889-885), Athaliah. 39. K. Ahaziah (B. C. 906-884), Zibiah. 40. K. Joash (B. C. 885-839), Jehoaddan. 41. K. Amaziah (B. C. b. 864, d. 810), Jecholiah. 42. K. Uzziah (B. C. b. 826, d. 758), Jerusha. 43. K. Jotham (B. C. b. 783, d. 742). 44. K. Ahaz (B. C. b. 787, d. 726), Abi. 45. K. Hezekiah (B. C. b. 751, d. 698),Hephzibah. 46. K. Manasseh (B. C. b. 710, d. 643), Meshulle­meth. 47. K. Amon (B. C. b. 621, d. 641), Jedidiah. 48. K. Josiah (B. C. b. 649, d. 610), Mamutah. 49. K. Zedekiah (B. C. 599-578). 50. Q. Tea Tephi (b. B. C. 565), marries Herre­mon, a Prince of the scarlet thread. 64. K. Giallchadh (reigned 9 years). 66. K. Simeon Breac (reigned 7 years). 67. K. Muirteadach Bolgrach (reigned 4 years). 68. K. Fiachadh Toigrach (reigned 7 years). 69 K. Duach Laidhrach (reigned 10 years). 74. K. Jaran Gleofathach (reigned 7 years). 75. K. Coula Cruaidh Cealgach (reigned 25 years). 76. K. Oiliolla Caisfhiachach (reigned 28 years). 77. K. Eochaidh Foltleathan (reigned II years). 78. K. Aongns Tuirmheach Teamharch (reigned 30 years). 89. K. Criomhthan Niadhnar (reigned 16 years). 91. K. Fiachadh Fionoluidh (reigned 20 years). 92. K. Tuathal Teachtmar (reigned 40 years). 93. K. Coun Ceadchathach (reigned 20 years). 100. K. Nail of the Nine Hostages. 104. K. Fergus More (A. D. 487). 111. K. Eugene. V. (d. 692). 113. K. Eugene VII. (d. A. D. 721), Spondan. 114. K. Etfinus (d. A. D. 761), Fergina. 115. K. Achaius (d. A. D. 819), Fergusia. 116. K. Alpin (d. A. D. 834). 117. K. Kenneth II. (d. A. D. 854). 118. K. Constantin II. (d. A. D. 874). 119. K. Donald VI. (d. A. D. 903). 120. K. Malcolm I. (d. A. D. 958). 121. K. Kenneth III. (d. A. D. 994). 122. K. Malcolm II. (d. A. D. 1033). 124. K. Duncan I. (d. A. D. 1040). 125. K. Malcolm III. Canmore (A. D. 1055-1093). Margaret of England. 126. K. David I. (d. A. D. 1153), Maud of Northumberland (i.e., North-Kumbri-land). 127. Prince Henry (d. A. D. 1152), Adama of Sur­rey. 128. Earl David (d. A. D. 1219), Maud of Chester. 131. Robert Bruce V. m. Martha of Carrick. 132. K. Robert I. Bruce (A. D. 1306-1329), Mary of Burke. 134. K. Robert II. (d. A. D. 1390), Euphemia of Ross (d. A. D. 1376). 135. K. Robert III. (d. A. D. 1406), Arabella Drummond (d. A. D. 1401). 136. K. James I. (A. D. 1424-1437), Joan Beaufort. 137. K. James II. (d. A. D. 1460), Margaret of Gueldres (d. A. D. 1463). 138. K. James III. (d. A. D. 1488), Margaret of Denmark (d. A. D. 1484). 139. K. James IV. (d. A. D. 1543), Margaret of England (d. A. D. 1539). 140. K. James V. (d. A. D. 1542), Mary of Lorraine (d. A. D. 1560). 141. Q. Mary (d. A. D. 1587), Lord Henry Darnley. 142. K. James VI. and I. (A. D. 1603-1625), Ann of Denmark. 143. Princess Elizabeth (1596-1613), K. Frederic of Bohemia (1632). 144. Princess Sophia, m. Duke Ernest of Brunswick. 145. K. George I. (1698-1727), Sophia Dorothea of Zelle (1667-1726). 146. K. George II. (1727-1760), Princess Caroline of Anspach (1683-1737). 148. K. George III. (1760-1820), Princess Sophia of Mecklenburgh-Strelitz (1744-1818). 150. Q. Victoria (b. 1819, Crowned 1838, d. 1901), Prince Albert of Saxe-Coburg-Gotha. William is second in line to the throne after his dad, Prince Charles. Below is a list of members of the Royal Family and the order in which they would become King or Queen if our current Queen, Elizabeth II, died or stepped down. It is called the line of royal succession. "O Come, O Come, Emmanuel!" Which Emmanuel are you looking for? "O come, O come, Emmanuel; And ransom captive Israel; That lies in lonely exile here; Until the Son of God appear; Rejoice, Rejoice, O Israel. To thee shall come Emmanuel"
(7th of the O Antiphons of Advent). Israel longed for His coming, in fact, the whole world longed for His coming. But His coming came in a way that neither foresaw. Rome had many prophecies regarding the coming of a king to rule the world. This, of course, was not to their liking. Rome was a Republic (even if only marginally so under the Caesars), ruled by the Senate, the voice of the people of Rome. A king would put this rule in danger, in their minds. Even the Israelis, who saw themselves as suffering under the rule of Rome (even though Rome allowed Israel to be ruled by King Herod, under Caesar), longed for a king to come and free them from Rome, to install Israel to the glory of it's past. A new David, a new Solomon. This was spoken of in prophecy. "Get you up to a high mountain, O Zion, herald of good tidings; lift up your voice with strength, O Jerusalem, herald of good tidings, lift it up, fear not; say to the cities of Judah, 'Behold your God!' Behold, the Lord GOD comes with might, and His arm rules for Him; behold, His reward is with Him, and his recompense before Him. He will feed His flock like a shepherd, He will gather the lambs in His arms, He will carry them in His bosom, and gently lead those that are with young" (Isaiah 40: 9-11). He will come in might to oppose the might of Rome, rule with a strong arm, etc. Prophecy said that He would be the shoot from the root of Jesse, and God would give Him the kingdom of His ancestor David. What else could it mean? It was natural for mankind to see their savior as a political one. A great warrior and king. Where else but in royalty would He come? Even Sidhartha (Buddha) was said to have been born of Indian royalty. Walking immediately and lotus blossoms blooming wherever he stepped. It was logical: to end oppression, one needed a political solution. To stop one king or emperor, you needed another to oppose him. But God's ways are not our ways. While Israel looked for a political leader, a warrior king, they missed a small cave used as a stable, and the great event that occurred there. And the first this great news, this wondrous gift was proclaimed to wasn't the affluent and powerful, but the weak and lowly. The shepherds in their fields. This is the way of the Lord, not power politics. Poverty and humility, not power and pride. Look through the New Testament. Did Christ confront Caesar? Did He ever call for his overthrow? "Tell us, then, what you think. Is it lawful to pay taxes to Caesar, or not?" But Jesus, aware of their malice, said, 'Why put Me to the test, you hypocrites? Show Me the money for the tax.' And they brought Him a coin. And Jesus said to them, 'Whose likeness and inscription is this?' They said, 'Caesars.' Then He said to them, 'Render therefore to Caesar the things that are Caesar's, and to God the things that are God's'" (Matthew 22:17-21). Hardly the words for a king bent on saving someone though political means. These words alienated the Zealots from following Christ. While the Pharisees tried to use political means to get rid of Him, hoping they could accuse Him of treason against Rome. Was He a social revolutionary? In the previous passage above, the Pharisees and Herodians answered it. "Teacher, we know that You are true, and teach the way of God truthfully, and care for no man; for You do not regard the position of men" (Matthew 22: 16). "When they came to Capernaum, the collectors of the half-shekel tax went up to Peter and said, 'Does not your teacher pay the tax?' He said, 'Yes.' And when he came home, Jesus spoke to him first, saying, 'What do you think, Simon? From whom do kings of the earth take toll or tribute? From their sons or from others?' And when he said, 'From others,' Jesus said to him, 'Then the sons are free. However, not to give offense to them, go to the sea and cast a hook, and take the first fish that comes up, and when you open its mouth you will find a shekel; take that and give it to them for Me and for yourself'" (Matthew 17: 24-27). Christ knew the tax was unfair, but did He refuse to pay it? (Though admittedly He found a singularly unique way of paying it.) He taught: "Then said Jesus to the crowds and to His disciples, 'The scribes and the Pharisees sit on Moses' seat; so practice and observe whatever they tell you, but not what they do; for they preach, but do not practice. They bind heavy burdens, hard to bear, and lay them on men's shoulders; but they themselves will not move them with their finger. They do all their deeds to be seen by men; for they make their phylacteries broad and their fringes long, and they love the place of honor at feasts and the best seats in the synagogues, and salutations in the market places, and being called rabbi by men'" (Matthew 23: 1-7). Christ knew who the Pharisees were, He knew they were 'whited sepulchres' (ref. Matthew 23:27) saying all the right things to make people praise them, even though their hearts were far from God. They imposed laws set by their own desires rather than God's. In many ways, they are more like dissidents of today rather than early Christians. When Christ drove the merchants out of the Temple it wasn't as a social revolutionary, but rather as one burning with love for God. "'Take these things away; you shall not make My Father's house a house of trade' His disciples remembered that it was written, 'Zeal for thy house will consume me'" (John 2: 16-17). It wasn't just the merchants, the Temple had gone from being a place of worship of God and remade into a temple to worship man. But Christ's ways are revolutionary in one respect. They don't conform to the ways of the world. Christ taught: "Blessed are you poor, for yours is the kingdom of God. "Blessed are you that hunger now, for you shall be satisfied. "Blessed are you that weep now, for you shall laugh. "Blessed are you when men hate you, and when they exclude you and revile you, and cast out your name as evil, on account of the Son of Man! Rejoice in that day, and leap for joy, for behold, your reward is great in Heaven; for so their fathers did to the prophets. "But woe to you that are rich, for you have received your consolation. "Woe to you that are full now, for you shall hunger. "Woe to you that laugh now, for you shall mourn and weep. "Woe to you, when all men speak well of you, for so their fathers did to the false prophets. "But I say to you that hear, Love your enemies, do good to those who hate you, bless those who curse you, pray for those who abuse you. To him who strikes you on the cheek, offer the other also; and from him who takes away your coat do not withhold even your shirt. Give to every one who begs from you; and of him who takes away your goods do not ask them again. And as you wish that men would do to you, do so to them" (Luke 6: 20-31). So, we have to ask ourselves, which Emmanuel are we looking for? Which do we hope to see? The political revolutionary? If so, He isn't coming. If one comes claiming to be Him, beware. Or are we looking the child? The humble Christ? The Christ born in poverty, proclaimed to the lowly, who rejected coronation, and, ultimately, stretched out His hands and arms to be nailed to a cross. But in this way He freed us. Not from political or social oppression, but from sin and death. Not in politics or social programs but from changing hearts. "I am the way, and the truth, and the life; no one comes to the Father, but by me" (John 14:6). So, between the wrappings, the glitter, baubles and lights, think of the Babe in the manger. "Jesus, meek and humble of heart. Make my heart like unto Yours." LONDON (AFP) - Britons are increasingly backing Prince William to inherit the throne ahead of his father Prince Charles, according to a series of polls. A total 39 percent of respondents agreed that William, second in line to the throne, should succeed Queen Elizabeth II as Britain's next monarch, up 11 points since last year, a YouGov poll showed. Those backing heir to the throne Charles to be the next king also stood at 39 percent, but represented a fall of nine points on a year ago, according to the survey published in The Mail on Sunday weekly tabloid. The number in favour of Charles is in line with a separate survey of young Britons published Sunday, which showed that 38 percent of 16- to 24-year-old respondents wish to see him succeed the queen. But young Britons overwhelmingly prefer William as the next monarch -- 60 percent according to an ICM survey. The telephone poll of 502 young Britons was carried out last Wednesday and Thursday after the publication of a book by Princess Diana's former butler, Paul Burrell, which heavily criticises the royal family's treatment of William's mother while she was alive. According to the ICM survey, 88 percent of young Britons believe William sets a "good example" on how to live, compared with 69 percent who say the same is true of the queen and 55 percent of Charles. Both royal polls were published just months after a leading British think-tank, the Fabian Society, said the monarchy needed a radical shake-up to survive. In the YouGov poll of just over 2,000 British adults, half of respondents said the monarchy should be retained only if reformed, up nine points from last year, while 21 percent said it should be abolished, a rise of three points. Meanwhile, a quarter of young Britons predict that the monarchy will be dead within a decade, while 82 percent agreed that the royal family is "over-privileged" and 75 percent said it is "out of touch with ordinary people". On a positive note for the royals, 81 percent of 16- to 24-year-old think they are good for tourism, 79 percent for charities and 71 percent said they give Britain prestige abroad. Prince Charles spent Saturday revelling in former royal splendour Indian-style; visiting ancient palaces and meeting Indian ex-royalty in Jaipur, capital of the western desert state of Rajasthan. He arrived there late Friday and was accorded a royal welcome by the Maharani (queen) of Jaipur Gayatri Devi and brigadier Bhawani Singh, former nobles from this state where princes ruled provinces for decades before the practice was scrapped in 1969. Charles is on his first visit to India since a disastrous six-day trip in February 1992 with his then wife, the late Diana Princess of Wales. They divorced 10 months later. His trip comes after publication of the tell-all book by Burrell, which has put the late princess back on the front pages of newspapers here. 21.06.2003 Prince William gives an interview to the Press Association to mark his 21st birthday. By Peter Archer, Court Correspondent, PA News. Prince William learned his A-level results in August 2000, whilst in the jungle in Belize during the first stage of his gap year. He was preparing for survival exercises with the Welsh Guards, of which The Prince of Wales is Colonel. “St James's Palace is pleased to announce Prince William's A-level results: History of Art - B; Geography - A; Biology - C,” said The Palace statement. The Prince left Eton College, Windsor, a month after his 18th birthday. His stay in Belize involved sleeping in a hammock strung between trees, wearing jungle combats, hats and boots, and eating British Army rations. After the Belize visit, Prince William spent a private few weeks engaged in an educational project. Prince William is second in line of succession to the throne, after his father, The Prince of Wales, who is heir apparent. The 22-year-old Prince does not yet carry out his own public engagements, but he has accompanied his father on several official visits. In September 2001, Prince William began a four-year degree course at St Andrews University in Scotland. In May 2003, he gave an interview and some photographs were released to mark the mid-point of his studies. In June 2003, another interview and more photographs of Prince William were released to celebrate his 21st birthday. To mark the special occasion, photographer, Mario Testino also took some photographs of the young Prince, who celebrated his birthday with a party held at Windsor Castle. At this time he also accompanied The Prince of Wales on an official visit to Wales, where he chose to carry out both rural and urban engagements. The Prince of Wales and Prince William visited the Anglesey Food Fair at the Anglesey Showground and then went on to Newport to open a new homeless charity day centre for Newport Action for Single Homeless (NASH). Before Christmas 2003 Prince William took part in a photocall in St Andrews and another with his father at The Prince of Wales' Duchy Home Farm in May 2004. In June 2004, Prince Harry and his brother Prince William attended the funeral of their maternal grandmother, Mrs Frances Shand Kydd in Oban, Scotland. During the private service, Prince William read a lesson from the Jerusalem Bible, Romans Chapter 8; Verses 35 - 39. Later, Prince William and his brother Prince Harry joined members of the Spencer family at a private burial at a cemetery at the edge of the town. Prince William, Prince Harry and their father The Prince of Wales accompanied The Queen and The Duke of Edinburgh to the opening of the Diana, Princess of Wales Memorial Fountain in Hyde Park, London on July 6th 2004. On July 10th 2004, Prince William and Prince Harry made a surprise appearance to show their support for Sport Relief's one mile charity event in London. Prince William is currently in the final year of his geography degree at St Andrews University. To mark his 21st birthday, Prince William agreed to be interviewed by the Press Association and posed for photographs by Mario Testino. In the second part of what is his frankest and most revealing interview ever, William answers questions about his life, girls, the monarchy, the media and his future. William will do his duty and be King. That is the clear message which, as he comes of age, William wants to send. He unequivocally denied rumours that he would not accede to the throne after his father, the Prince of Wales, and take his place in the line of succession. Straightening his back, William answered the question: Do you want to be King? "All these questions about do you want to be King? It's not a question of wanting to be, it's something I was born into and it's my duty," he said. "Wanting is not the right word. But those stories about me not wanting to be King are all wrong. "It's a very important role and it's one that I don't take lightly. "It's all about helping people and dedication and loyalty which I hope I have – I know I have. "Sometimes I do get anxious about it but I don't really worry a lot. I want to get through university and then maybe start thinking seriously about that in the future. "I don't really ever talk about it publicly. It's not something you talk about with whoever. "I think about it a lot but they are my own personal thoughts. I'll take each step as it comes and deal with it as best I can." William said he sometimes felt part of history, especially when he was with the rest of the Royal Family. "I'm sure a lot of people would love to get me doing royal engagements already," he said. "But I will wait until the end of my education before I even think about doing solo engagements. "I will obviously do the odd one or two with my father, like I did in Wales before my birthday. But I just think, for the moment, I should concentrate on university – it's quite hard enough as it is." William praised the Queen and said, as he faces up to one day being King, she is his inspiration. "I think particularly nowadays the monarchy plays a very important role. You only have to look at my grandmother and see the amazing things she's done," he said. "That to me is a huge inspiration – the work she's done and the work my father's done and a lot of the family. "The monarchy is something that needs to be there – I just feel it's very, very important - it's a form of stability and I hope to be able to continue that." "Modernisation is quite a strong word to use with the monarchy because it's something that's been around for many hundreds of years," he said. "But I think it's important that people feel the monarchy can keep up with them and is relevant to their lives. "We are all human and inevitably mistakes are made. But in the end there is a great sense of loyalty and dedication among the family and it rubs off on me. "Ever since I was very small, it's something that's been very much impressed on me, in a good way. "People say it's not ambitious, but it is actually quite ambitious wanting to help people. "Trying to keep that going is quite tricky and it's something that, without the whole family, is harder for just one person to do. "It would be dangerous to look a long way ahead and predict changes in the monarchy. "I think my grandmother is incredibly good at managing the different aspects of being sovereign and putting across the monarchy. "She is able to really promote the monarchy without getting too involved in things that she almost definitely has a view on, an opinion of her own. "But, frankly, she does what she feels is right and I think that's very impressive." 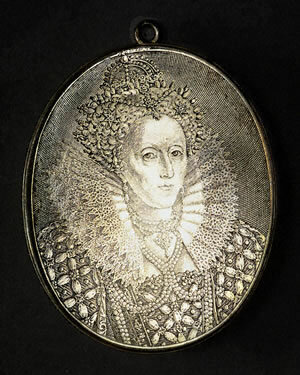 Along with his father, the Queen was a role model for William. "I think of the Queen first and foremost as my grandmother and to me that's important," he said. "She's a huge role model for me – she's incredible – and in the family she's one of the biggest role models I have, along with my father. "My grandmother has achieved so much in her lifetime and she's just so experienced. For me she symbolises the monarchy. "She's been put in some really difficult positions and yet she handles it very well. What she's done for this country is amazing." William does not have a steady girlfriend. But if the right girl comes along, he is ready to make his move. However, the 21-year-old Prince, who is among the most eligible bachelors in the world, realises the media scrutiny his girlfriend would be subjected to and is protective towards any potential date. "There's been a lot of speculation about every single girl I'm with and it actually does quite irritate me after a while, more so because it's a complete pain for the girls," he said. "These poor girls, you know, who I've either just met and get photographed with, or they're friends of mine, suddenly get thrown into the limelight and their parents get rung up and so on. "I think it's a little unfair on them really. "I'm used to it because it happens quite a lot now. But it's very difficult for them and I don't like that at all." William would not be drawn on media speculation about specific girls in his life. But he said: "I don't have a steady girlfriend." Not that he is uninterested in romance with the right girl. "If I fancy a girl and I really like her and she fancies me back, which is rare, I ask her out," he said. "But, at the same time, I don't want to put them in an awkward situation because a lot of people don't quite understand what comes with knowing me, for one, and secondly, if they were my girlfriend, the excitement it would probably cause." William, who is modest about his appeal, joked: "Only the mad girls chase me, I think. "No, I've never been aware of anyone chasing me but if there were, could they please leave their telephone number," he said, laughing. It was his trademark gesture which infuriated photographers and earned him the reputation of being shy. But William protested that he was never shy – just naive about how to avoid being photographed. "I was never shy," he said. "But, it's very funny. I was called shy because I put my head down so much when I was in public. "It was never because I was shy. It was a really naive thing that I hadn't picked up on. "I know it's silly and that everyone will laugh at it. But I thought that, when I was in public, if I kept my head down, then I wouldn't be photographed so much. "Therefore, I thought, people wouldn't know what I looked like so I could go about doing my own thing which, of course, frankly was never going to work. "It was so that people wouldn't recognize me and I could still go out with friends and things like that. "So they just saw the top of my head. But usually I was photographed with my eyes looking up through a big blond fringe. It was very silly. "I wouldn't say I prefer to be unnoticed because that's never going to happen. "But I'm someone who doesn't particularly like being the center of attention." As he turns 21, William appealed to the media to continue to allow him privacy at university. He thanked the media for giving him space to be himself and complete his formal education while he was at Eton and now at St Andrews University in Scotland. "They have been really good about the whole thing and I'm sure they've been very frustrated at the same time," he said. "I just feel it's better for both sides, St James's Palace and the media, that it happens this way. "I don't think either side wants to return to the free-for-all of the old days. "It's a really fine balance and it could be quite volatile if things get out of hand," he said. "So I don't want to go back to that – I've seen it and I don't like it – and I hope that it all works out the way it is." Since the death of their mother, Diana, Princess Of Wales, the media have agreed to leave William and his younger brother, Harry, alone to complete their education. In return, William and Harry have been willing to give interviews and photocalls at significant points in their lives. For someone, who when he was younger, was thought to dislike media attention, at 21 William is determined to act like an adult. "The media can be tricky at times but so can most people," he said. "But it's something that I want to handle with the most maturity I can. "So it is difficult but it's not impossible. "The way it's been handled so far, particularly to do with me, has been amazing from both sides, St James's Palace and the media. "I just really hope that continues because I've had such a good time in my first two years at St Andrews and I would be absolutely gutted if that disappeared." As for his portrayal in the media, William said he just wanted to be seen as himself. "My own portrayal has been something that I hope people take with a pinch of salt sometimes," he said. "I don't want to be anything I'm not and I don't want to come across as being super-human or an idiot. "I just want to come across as me – and I hope that's what will happen." He was born His Royal Highness Prince William of Wales but at 21 still wants to be known as just William. "This has been quite a confusing issue for a lot of people I think," he said. "I am and always will be an HRH. "But out of personal choice I like to be called William because that is my name and I want people to call me William – for now. "I was HRH Prince William as soon as I was born. But I don't want all the formalities because they're not needed for the time being." 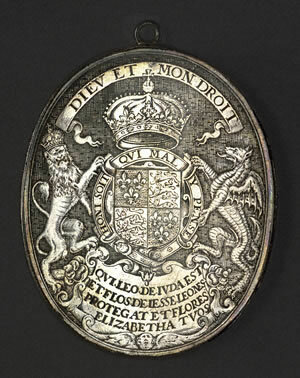 William has his own coat of arms, which was granted to him by the Queen on his 18th birthday, but he has not used it yet. Prince William requested the addition of an "escallop gules"
to honor his Mother, Diana. 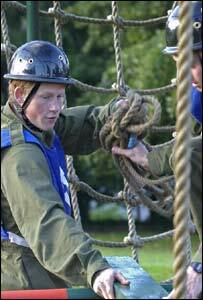 Prince Harry will join the Army in early 2005 after passing his Sandhurst entrance exams, Clarence House has said. Obstacle courses, medicals and planning exercise were included in the Regular Commissions Board four-day test. The 20-year-old, who is third in line to the throne, will begin training to be an officer after taking up his place. Sandhurst is the Army's most prestigious college. The prince said he was delighted to have passed his exams. "The last four days have been very challenging, both mentally and physically, but it's also been an enjoyable experience. "I have set my sights on joining the Army and I am really looking forward to going to Sandhurst next year." No details as to which regiment Harry might join have been announced. The academy in Camberley, Surrey, has three intakes a year in January, April and September but January is thought to be the most likely for Harry. The Prince of Wales and Harry's older brother Prince William were said to be proud of his achievement. A Clarence House spokesman said: "Obviously, they're very pleased for him. He told them both today." Prince Harry, who is believed to be the most senior British royal in recent memory to attend Sandhurst, had long hoped to secure himself a place. The new recruit is likely to be referred to as Wales, according to a Clarence House spokesman. The Eton-educated prince took his assessments alongside 31 other candidates in Westbury, Wiltshire, where the pass rate was around 60%. Other famous figures who attended Sandhurst include the Sultan of Brunei, Prince Michael of Kent and Sir Winston Churchill. Prior to beginning his Army career, the prince will be coaching with the Rugby Football Union and travelling abroad to play polo later this year. Harry, who has gained a reputation for enjoying parties and visiting nightclubs, will face a strict and regimented life at Sandhurst. For the first five weeks, cadets must remain on camp including at the weekends. And the prince could be called to fight in war zones after finishing his 44-week training. In 2003 several new Sandhurst officers were posted to serve in Iraq. By signing up, Harry is continuing a family tradition of military service. His father, the Prince of Wales, trained to be a pilot with the RAF. He also served in the Navy, as did the Duke of Edinburgh. And the Duke of York was a Sea King Pilot in the Falklands conflict. Elder brother William has also expressed his hopes of joining the forces.